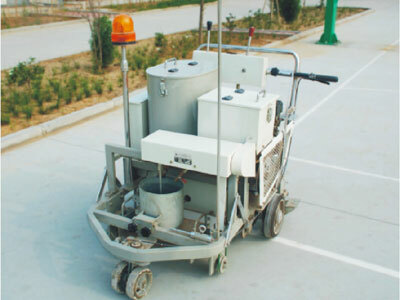 DY-SSTC-I/II self-propelled two-component paint road marking machine is mainly used for small scale road marking and zebra marking, with good proformance and long service life. 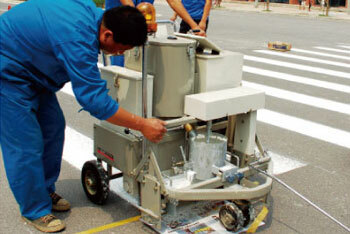 The screeding type can make the marking line straight and beautiful. The glass beads system make the galss beads uniform and saved. The devices of alloy chassis, high-speed bearing and corrosion-resistant rubber tyres with compact structure ensure the operation more flexible and durable. Advanced hydraulically powered variable speed transmission control system adjusts and controls speed accurately, and realizes self-walking function. The welded marking shoe made of wear resistant special steel owns the best stability, and ensures the marking line more regular and line thickness evener. 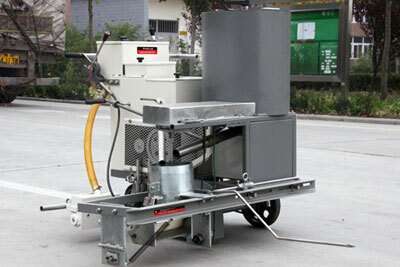 Its automatic stirring system can ensure the two components be mixed sufficiently, improving performance of paint greatly and prolonging lifetime of marking line. 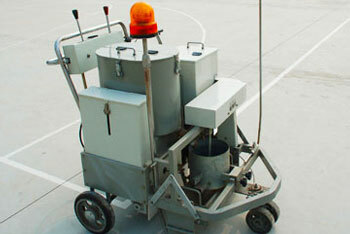 The width of marking line can be adjusted to other sizes according to customers' specific requirement. The automatic quantitative glass beads dispenser that is synchronous with the paint structural system ensures the dispensing evener，more exact economical. The directional device that can lock rear wheel ensures the marking machine walk along straight lines and turn freely on curved roads.